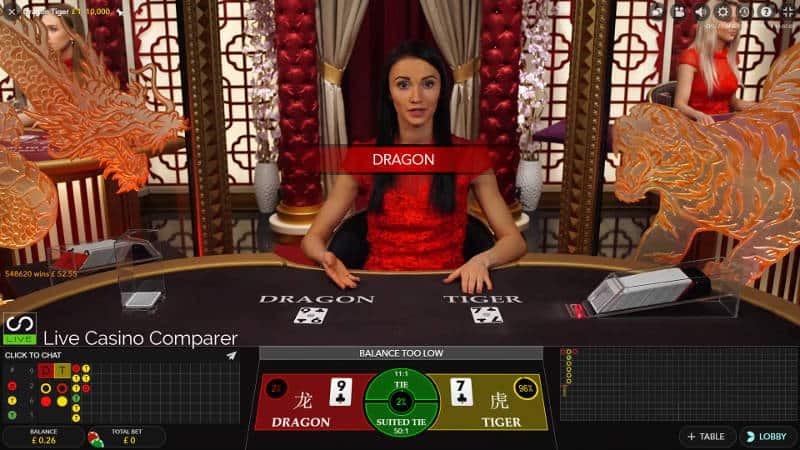 Evolution Dragon Tiger - A review by Live Casino Comparer. 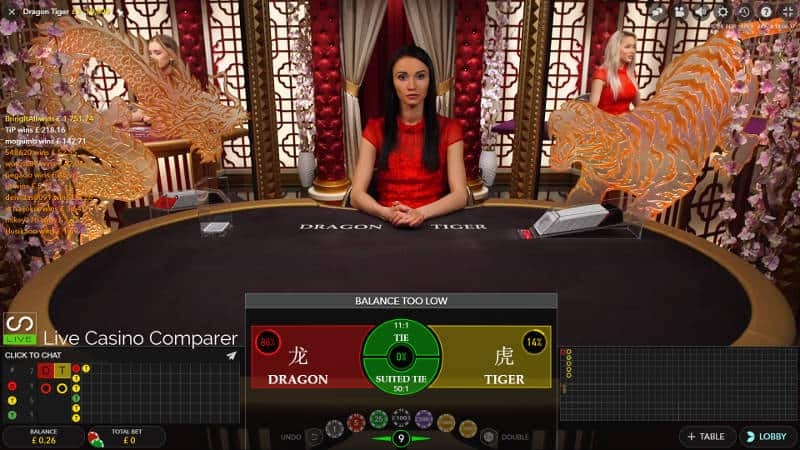 Evolution Dragon Tiger now completes the “Baccarat” style games that it can offer it’s customers. 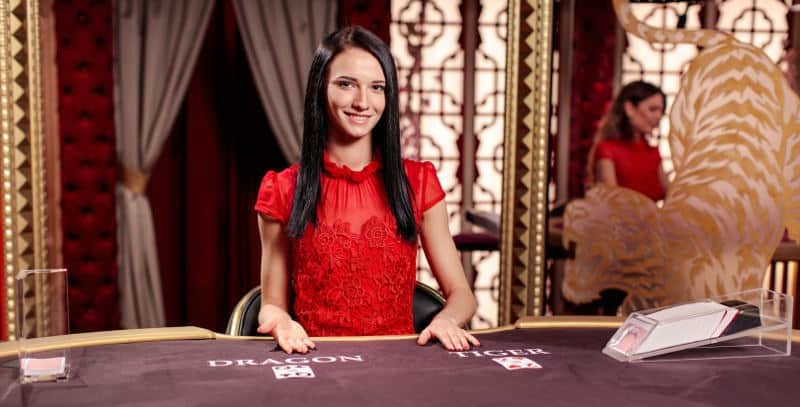 While there are other derivations of the game out there like Hi-Lo and War of Bets, Dragon Tiger is the only game that is presented in a Baccarat style. How is Evolution Dragon Tiger played? Quite simply, two cards are dealt, one to the Dragon and One to the Tiger. As a player you bet on which position will have the higher card. Kings are the highest card, Aces the lowest. A dealing shoe with 8 decks is used and this is changed when one deck is left. What does a winning hand Pay? A winning hand pays even money 1:1. Are there any Side Bets? There are two side bets. A Tie bet wins when both cards are the same. This pays 11:1. A Suited Tie bet pays when the cards are the same suit and same value. This pays a whopping 50-1. How long does a game round take? Game rounds are very quick at 25 seconds each. Betting time is restricted to 15 Seconds. What’s the Return to Player of the Game? The main game has an RTP of 96.72%. What device can you play on? Evolution Dragon Tiger can be played on all devices. On mobile you have the option to play in Portrait and landscape modes. A special area has been built at Evolutions’ studio in Riga to house the new table. It’s been decorated in an Asian theme with a large Dragon and Tiger either side of the table. The Dragon or Tiger lights up when there is a win. There is a complete set of Roadmaps, like Baccarat Roadmaps to chart the history of the shoe. I’m sure they are useful, I use a basic strategy when playing Baccarat and would probably apply the same principles to Dragon Tiger. Dragon Tiger can be found in the Baccarat lobby at most Evolution Live Casinos. Popular Casinos to try are Unibet and Leo Vegas. Dragon Tiger is a simple game, but that doesn’t make it any less enjoyable to play. What really enhances the game is the presentation of the table, the dealer and studio surroundings. Evolution has excelled itself this time. The environment has Asian influenced qualities about it, is light and airy and has fantastic lighting that interacts with the results of the table.